Last week, my 4-0 Yellow Jackets dubbed their primetime game against the Miami Hurricanes a White Out, and I wanted to get in the spirit by making a white food for our tailgate. 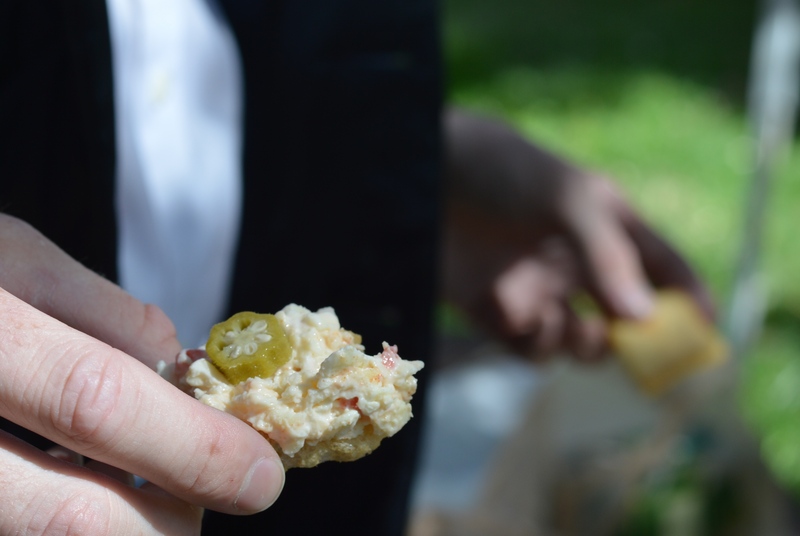 My good friend, the infamous sliced salmon critic, had a brilliant suggestion: white pimento cheese. Georgia Tech won the game, becoming one of only a handful of undefeated teams in the country, and my pimento cheese was a hit at the tailgate. 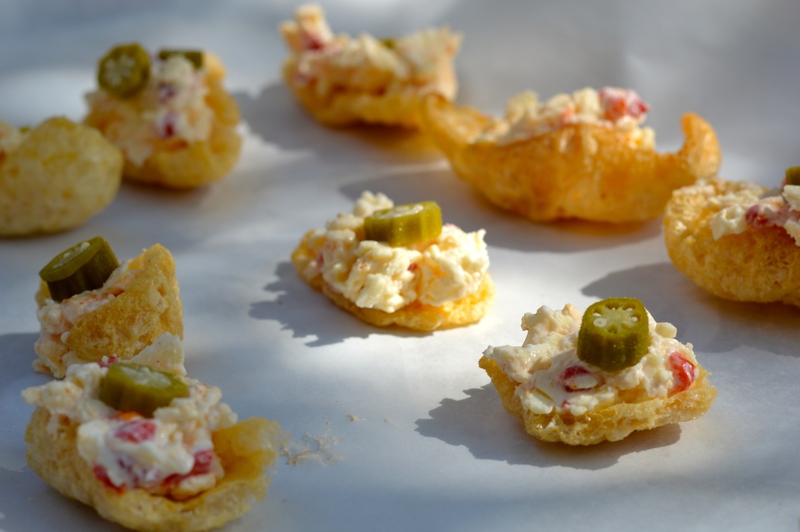 Of course, this is just like regular pimento cheese using white cheddar, but there is another small twist that makes this stuff really good: using a little Greek yogurt along with the mayonnaise. Let me be clear that this addition is NOT for health reasons; that would go against everything the Bachelor’s Test Kitchen stands for. The Greek yogurt just gives the pimento cheese a really nice extra shot of tartness that fools people into thinking you used fancier cheese than Publix brand. Suckers. 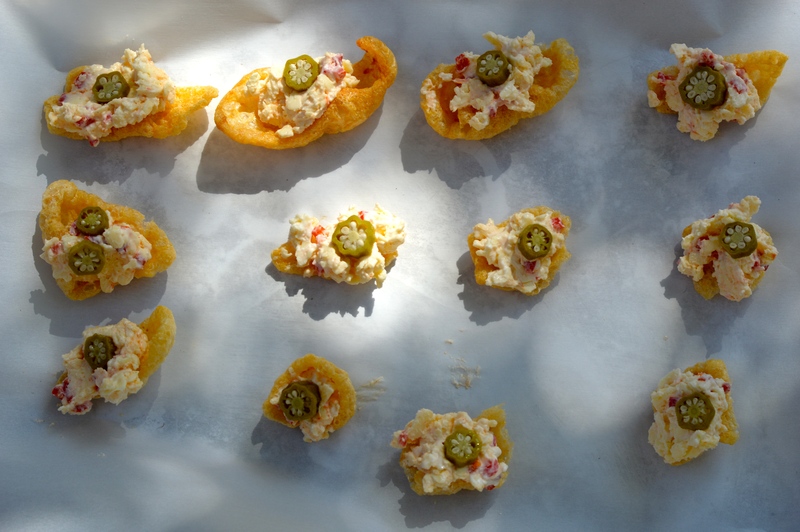 To counteract the healthiness of the Greek yogurt, I served the pimento cheese on pork rinds with a slice of pickled okra on top. This made my tailgate snack kind of redneck and classy at the same time, like a wedding in a barn. The serving idea comes courtesy of my parents’ tailgating friends at Clemson – I’ll see you guys in November. Mix all ingredients together in a large bowl using a fork. Don’t bother draining the pimentos – I prefer the extra flavor the canning liquid adds. Add extra mayonnaise if the pimento cheese is too thick. Refrigerate. NOTE: Make sure the cheddar is coarsely grated; don’t buy pre-shredded cheese, because it is coated in something that keeps it from sticking together, and that stickiness is key. That means grating the cheese yourself – don’t be lazy. Sorry I don’t have more pictures of the process! I made this stuff late on a Friday night and totally forgot to take pictures. I guess you should’ve come to the tailgate, huh?